TRAKTOR KONTROL Z2 puts our most advanced DJ controller in the body of a professional 2+2 channel mixer � TRAKTOR SCRATCH included. 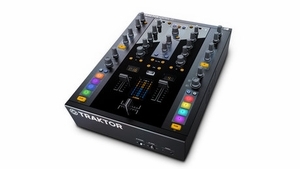 TRAKTOR KONTROL Z2 is the world�s first 2+2 DJ control mixer. Built tough for pro club use, the Z2 excels both as a state-of-the-art club mixer alongside turntables and CDJs, and as the hub of an advanced setup of Remix Decks and controllers. All-new Macro FX and Flux Mode in the latest TRAKTOR software expand your creative arsenal. And the heavy metal, standard installation-height chassis, sturdy RGB control buttons, and Innofaders� assure rock-solid dependability. Whatever your style, however you play, welcome to the future of mixing. TRAKTOR KONTROL Z2 delivers the reliability and pro sound quality essential for the world�s biggest stages and hottest clubs. Pro XLR outputs, a booth output and 24-bit sound quality mean your sets hit with maximum impact. Precision knobs, buttons, multi-colored cue point controls and Innofaders� give you ultra-accurate control of your sets. Whether spinning vinyl, CDJs, playing digital files, or using TRAKTOR SCRATCH timecode control, switching formats is just a push of a button away � lightning-fast, uninterrupted creative flow. And the heavy metal chassis means your busy schedule won�t take its toll on your new tool of choice. Think you know your limits? You�re about to erase them. For the first time, TRAKTOR KONTROL Z2 adds Macro FX to the TRAKTOR software. Build a big drop or destroy your track beyond recognition with fresh new effect combos like Wormhole, LaserSlicer and Bass-o-matic � get expressive sound manipulation with intuitive, one-knob action. Flux Mode tracks the time while you�re juggling cue points or looping, and lets you drop back in at exactly the right moment � a powerful weapon for all creative DJs. Integrate multiple TRAKTOR KONTROL F1 and X1 controllers with plug-and-play simplicity thanks to the Z2�s USB hub, freeing up additional ports on your laptop. Start using the included flagship TRAKTOR SCRATCH PRO 2 with Remix Deck� technology and TRAKTOR SCRATCH timecode vinyl in record time* � simply connect the Z2 to your computer with a single USB cable. Connect your turntables or CD decks with the inputs on the mixer and start using timecode control via vinyl or CDs. And thanks to TRAKTOR�s advanced HID integration, the Z2 integrates effortlessly with the latest Pioneer CDJ generation and mixers. POWER SUPPLY Internal power supply with 3-pin IEC power cable included. 115-230V, 50/60Hz, 0.5 � 0.75A. No additional power supply or battery required.